Janet Kurnatowski is pleased to present Linda Francis, Don Voisine, Joan Waltemath, Michael Zahn. The gallery is located at 205 Norman Avenue, in Greenpoint, Brooklyn and is open Friday through Saturday, 1 – 7 pm and Sunday 12 – 6 pm. The exhibition will be on view from March 27 – April 26, 2009. 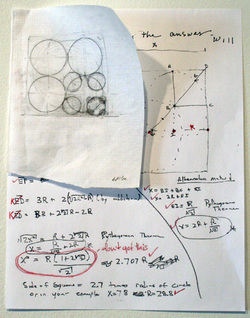 The opening reception for the artists will be from 7 – 9 pm on Friday, March 27, 2009. This show takes a focused look at four paintings, each one emblematic of a practice whose commitment to the medium has been a specific force in the development of an individual oeuvre. What the works have in common is the creation of an aesthetic reality based on the processes of cognition where notions of literality are inverted, and used as symbolic referents. Whether objectified or implied, aleatoric or given, rational or irrational, the referent in each work operates as a portal through which the experience of thought leads to insight. Meaning is shifted away from the referent, and painting is neither defined by nor limited to the cultural phenomena that gave it body. Francis, Voisine, Waltemath and Zahn have exhibited widely in the United States and Europe. Linda Francis’ last solo show, "Interference" was at Minus Space Project Space, NYC. Don Voisine’s next solo show will open on April 30th at McKenzie Fine Art in Chelsea. Joan Waltemath's last solo show, "Torso/Roots" was at Galerie von Bartha, Basel. Michael Zahn’s solo show "Michael Zahn as Michael Zahn" was at Eleven Rivington, NYC. For more information or images please contact the gallery.